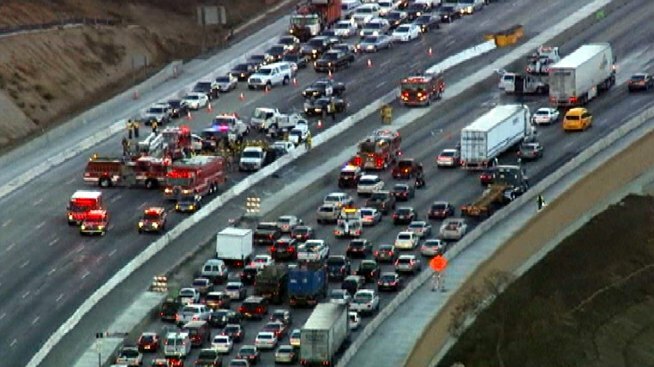 A 65-year-old Long Beach man was killed and his 19-year-old daughter -- a passenger in the car -- was injured Friday morning in a chain-reaction crash that shut down the 405 Freeway in the Sepulveda Pass. Aerial video showed firefighter-paramedics and several emergency vehicles on both sides of the freeway as they treated injured victims in the fatal crash and assessed motorists involved in a non-injury crash on the other side of the freeway. The fatal crash involved four vehicles, including a car that was crushed between a pickup and Mercedes Benz sedan. The deceased victim, whose name was not immediately released, was inside the crushed blue Ford Mustang with his 19-year-old daughter. The daughter and another driver were hospitalized with non-life threatening injuries, according to authorities. California Highway Patrol officers initially responded to a car fire at about 6:30 a.m on the freeway that connects the San Fernando Valley with LA's Westside. Officers responding to the car fire stopped to aid victims in a three-vehicle, non-injury collision on the southbound 405 Freeway. The four-vehicle fatal crashed occurred at about the same time on the northbound freeway when one vehicle stopped, leading to the chain-reaction collision, according to the CHP. Investigators have not determined why the driver stopped. The CHP did not confirm the crash was caused by drivers watching the car fire on the other side of the freeway. Traffic backed up for several miles in both directions throughout Friday morning.